Note: Many of the links on this page will only work if you are a member of Ravelry. It is free to join. This was my first attempt at illusion knitting. 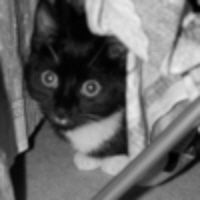 The picture was woolyimpi’s ravatar (Ravelry avatar) and shows her cat Jesse. The piece was inspired by this thread on the Woolly Thoughts group. Each of Steve’s’s illusions is designed so that when seen from straight in front, it doesn’t look like anything but when seen from the side, it looks like a picture seen from the side. I used a different method. My illusion is designed so that when seen from in front, it doesn’t look like anything but when seen from the right angle, it looks like the original picture did when seen from in front. 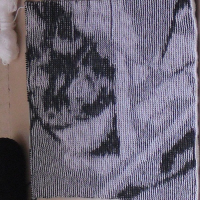 The picture is meant to be square but I used a column of four stitches to represent each pixel of the original, which had resulted in a knitted piece which is about 2.5 times as long as it is wide. To make the picture appear square, the photograph has been taken from an angle of 24°. The knitting was made progressively looser as it went on so that the left edge is about 10% bigger than the right edge. 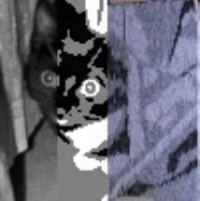 In the picture, the left edge is further from the camera than the right edge so the picture appears undistorted. This photograph gives an idea of the finished shape. 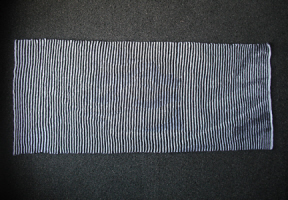 In reality, the knitting is straight black and white stripes. 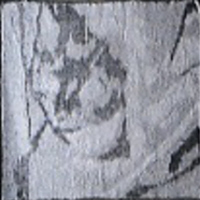 The photograph has distorted the stripes. 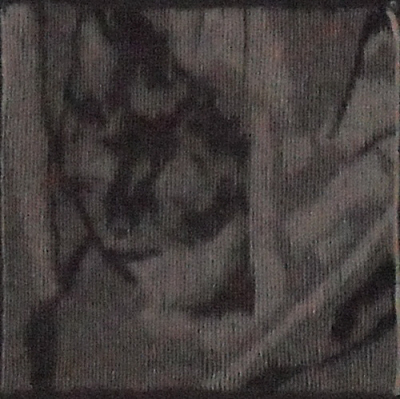 This little greyscale picture was appearing repeatedly down the side of a discussion about illusion knitting and I just thought it would make a good illusion itself.